Alcatel has announced MoveTime, a kids smartwatch that has water resistance and GPS at a price of Rs. 4,799 via Flipkart. 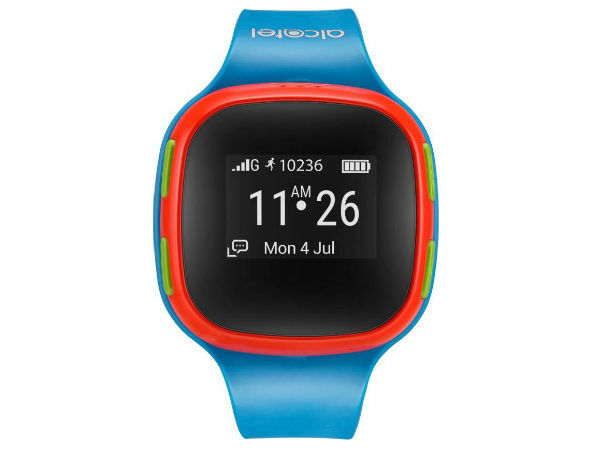 Alcatel announced the launch of 'MoveTime - Track & Talk' kids' Smart Watch, which allows kids to communicate with pre-approved contacts and incorporates GPS tracking, will be available exclusively on Flipkart.com. The 'MoveTime' children's watch helps parents stay connected with their little ones while also giving them control over their children's communication. The watch is powered by Nucleus operating system and sports an OLED 0.95- inch single white color (96*64) display and plays nicely with both iOS and Android. The Smart Watch isn't bulky with dimensions of 40x40x15.8mm and weighs less than 40 grams. 'MoveTime' watch is promising talking time upto 2hrs from the 370mAh pack with a full charge only taking 1.5hrs. The battery has a standby time, lasting up to four days. The 'MoveTime' Smart Watch features an SOS button for panic situations where a distress signal is sent to parents; calls from strangers are rejected automatically. Commenting on the launch, Mr. Krishan Kalra- Business Head- E Commerce, Alcatel India, said, "The Indian IoT market size is estimated to be around $300 billion by 2020 grabbing a 20% share of the worldwide IoT market. With more than 40% of our population below the age of 15, there is a strong need for safety and tracking wearable devices in the country. With children today being the digital natives, our Smart Watch ensures that parents stay connected to their kids 24x7 with this attractively designed and power efficient wireless GPS enabled watch that supports calling and GPS tracking." He also added, "Going forward our aim is to be a major player in the growing market with our focused IoT products and services. 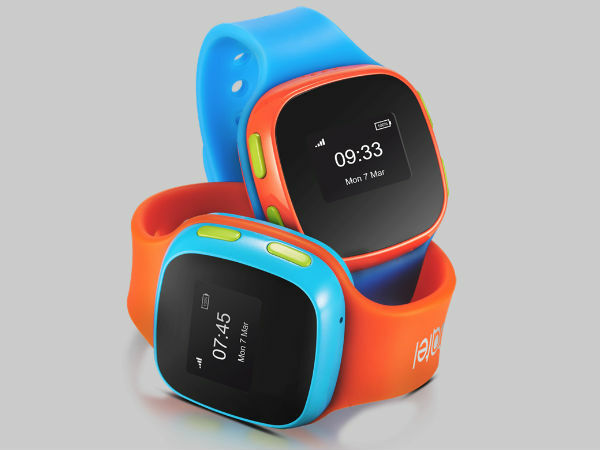 We are gearing up to launch newer variants targeting Kids Safety in the growing Android smart watch space." 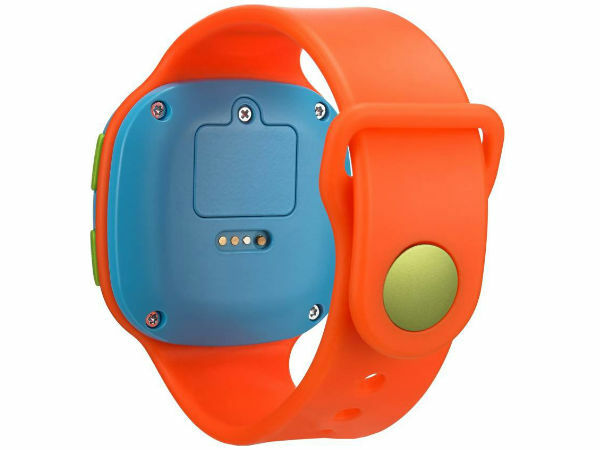 Aimed at children from age 5 to 11, the 'MoveTime' watch allows parents to call or send voice messages to their kids. Kids can reply to calls from up to 10 pre-set contacts and make calls to 5 registered numbers as the watch supports 2G network connectivity. The interface of the watch is simple that makes navigation for kids easy. Parents can track their kids' location on their smartphones with the help of dedicated iOS and Android app. They will be notified on their phone, when their children enter or leave a pre-determined safe zone. 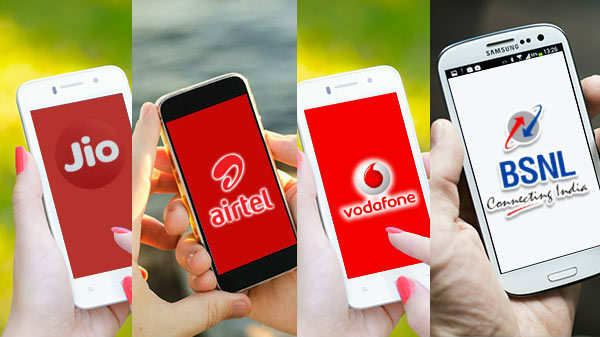 It would give peace of mind to the parents that their children are not getting influenced by strangers as they wouldn't able to receive calls from unregistered numbers. Parents can monitor location of child via the Smart Watch and in case, if they leave the preset area, parents will receive a notification. Mr. Adarsh K Menon, VP- Electronics, Flipkart, said, "Smart Wearable as a category has seen explosive growths on Flipkart over the last few months. So far this has largely been owing to increased need amongst consumers for connected devices that help them meet their health & fitness goals & also look good on them. We are now working with brands to expand this & cover the entire spectrum of use cases for the end consumer in this segment. The Alcatel kids safety watch that we have just launched is one such example." 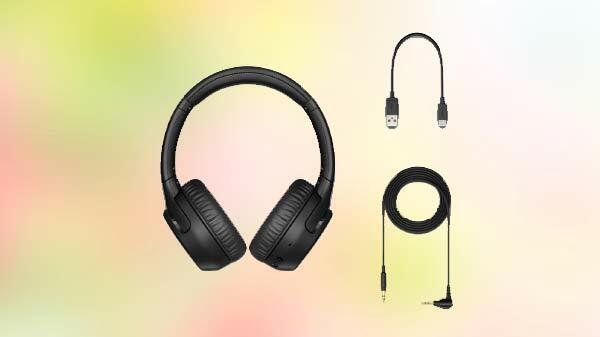 He also added, "This is a truly revolutionary product that caters to the customer need for safety for their children, via wearable connectivity. With its inbuilt capabilities such as GPS tracker, geo fencing and preset numbers calling facilities, it offers end to end solution to parents concerned about their kids' safety. 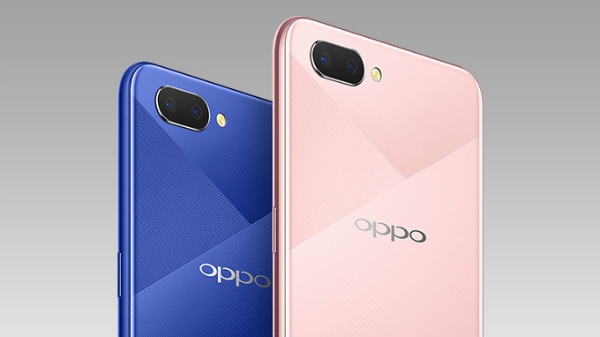 With many more such products to be launched in the pipeline, we are geared up to offer latest products which resonate with customers' demand and the technological advancements globally." 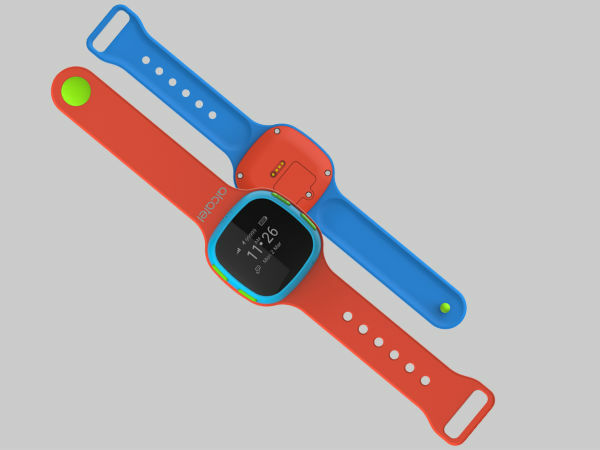 The 'MoveTime' watch uses GPS, GSM and Wi-Fi, to locate kids' indoor and outdoor location within 60 seconds due to dedicated cloud service. It will alert parents when their child leaves a marked safe zone area. This ensure the parents that there child is in safety zone area or not. 'MoveTime' also comes in two different color combinations (Blue + Orange Wristband & Red + Blue Wristband), and is IP65 rated for resistance against dust and water. Kids can play in the pool while wearing this watch, which is something kids do a lot. Input the IMEI to pair your watch - Obtain the information of IMEI number through the package information or pressing Volume +/- and the SOS key in the same time until the information displayed on the screen. Then input the IMEI number to the application information bar and confirm. The server will send a random code to your watch and the information displayed on the screen should be noted at this time. Input the random code to the application information bar and confirm. Scan the QR code to pair your watch - User can share the QR code to add some group members. Scanning the QR code will be automatically adjusted according to the interval time. · Voice message: Touch to enter the voice screen. When users create a voice message, the length of each recording is 15s. They can dialogue with some group members, or dialogue with their children alone. · Safe zone: Touch to enter the Safe zone screen. In this function, user can set an area on the map as a safe area for your child. When their child leaves the security area, they will be notified. Pay attention that the timeliness of the notification will depend on the frequency of the location. The longer interval time for positioning that they set, the time to receive the notification will be relatively longer. · Save power: Touch to enter the power screen. You can choose the location frequency according to the daily usage habit. Different positioning mode will affect the positioning accuracy and standby time. Choose the appropriate use mode according to the actual scene. · Mute time: Touch Mute time to set the reminder function of your watch. You can set to mute or cancel the vibration according to the actual environment in use by your children. Pay attention that in the silent mode, children can recover the setting by adjusting the volume of the watch. But in the vibration mode, it needs to be recovered through application setting. · Upgrade: Touch Update to upgrade your watch and App. The status bar at the bottom will display the related downloading progress when upgrading. Be aware that the watch relies on the network when upgrading. It will use a certain amount of data. · Member management: Touch Family numbers to open the member list and set the local emergency call number. Note: Each device will have only one administrator, and the user will be regarded as an administrator for the first time. Administrator can transfer the management rights in the members' management page.